Under selection, an endangered species runs low on evolutionary “fuel” « Nothing in Biology Makes Sense! The reason for this arises directly from the nature of natural selection. Recall how selection works: if a population of birds will adapt over time if they vary in some trait that contributes to their survival, mating success, and fertility — and if the variation in that trait has a genetic basis. That is, for natural selection to work, the birds must differ in at least one survival-related trait, and they must pass those differences on to their offspring. Natural selection is just what it says on the box — selection. As a process, it removes less-successful genetic variants from a population, but it cannot introduce new variation. New variation is created by mutation, usually as glitches in the process of DNA replication. Larger populations, in which more individuals are reproducing, have proportionally more opportunities for mutation than smaller ones. Larger populations can also retain more mutations with effects that are too small to make much difference to natural selection, but which might come in handy if the environment changes or a new disease arrives. Living populations are like libraries of genetic variants on a biological theme — all the different ways to be a healthy and fertile pale-headed brush finch — waiting for natural selection to sort through them for the variants that can best survive a plague or a drought or the aftermath of a forest fire. The pale-headed brush finch’s near-extinction may have whittled its library down to the point that those variants simply don’t exist. Fortunately for the brush finches, we now have methods for directly assessing the breadth of variation in their genetic library. Stefanie Hartmann, Martin Schaefer, and Gernot Segelbacher, three biologists at the University of Freiburg, in Germany, report such an assessment in a paper recently published in the journal Molecular Ecology. And they found that, genetically, the finches have not yet recovered from the bottleneck. Hartmann, Shaefer, and Segelbacher collected blood samples from 91 pale-headed brush finches, extracted DNA, and assessed their variation at two different kinds of genetic markers. The first kind of markers were microsatellites, regions of DNA sequence dominated by repetitions of short “motifs” of genetic letters — ATATATAT or GAGAGA or similar — with different individuals carrying different numbers of repetitions of the motif. Microsatellites are widely used in conservation genetics because they’re relatively easy to develop for species that haven’t had extensive prior genetic analysis, and they’re cheap to genotype — rather than directly read their sequence, biologists can simply count the number of repetitions of the motif. Their repetitive structure, and the fact that they usually have no biological function, also means that microsatellites accumulate mutations, and specifically new repetitions of their motif, relatively rapidly. So the microsatellite data could give Hartmann and her coauthors a general sense of the brush finches’ genetic variability, but they don’t necessarily represent the genetic variation that actually matters to natural selection. So Hartmann et al. also collected sequence data from five immune receptor genes with roles in recognizing and neutralizing pathogens. Variation in these genes is important, because different variants of each gene will vary in the specific pathogens they recognize — a population with lots of immune receptor variation presents lots of options to natural selection imposed by disease. 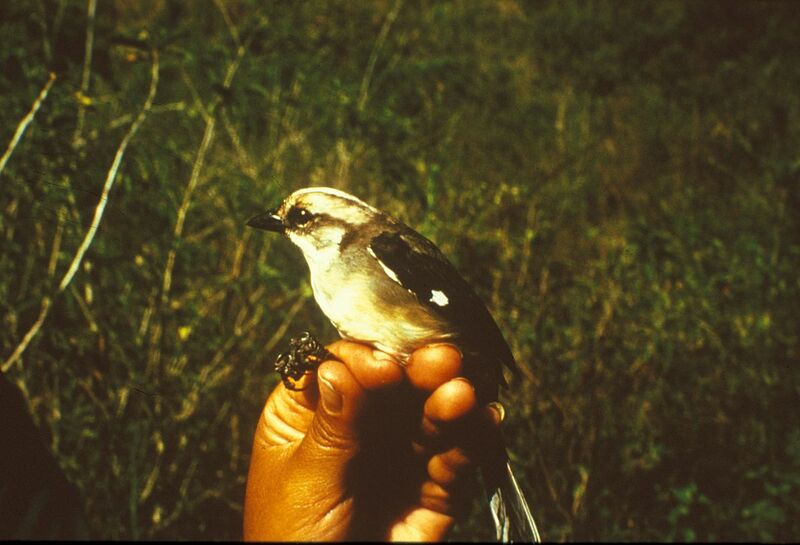 As standards for comparison, the coauthors also collected genotype data from nine pale-headed brush finch specimens from museum collections in Great Britain and Ecuador, and from samples of two similar, closely related bird species living near the brush finch reserve, Atlapetes latinuchus and Buarremon torquatus. These other birds have maintained much larger populations while the pale-headed brush finches went through their bottleneck, and so would be expected to have maintained more genetic diversity, too. The microsatellite data from the brush finches showed patterns of variation associated with a recent population decline. Impressively, the authors’ analysis of variation at the microsatellite data found it was consistent with a population of about 223 birds, just five short of an estimate based on counting birds at the reserve. However, the museum specimens and the two comparison species didn’t have significantly greater microsatellite variation than that seen in the contemporary pale-headed brush finches. That could reflect poor statistical power, or it could reflect the rapid mutation of microsatellite markers — the pale-headed brush finches have actually recovered a lot of diversity at those points in the genome. The immune genes told a different story. The pale-headed brush finches had lower diversity in the sequences of the five immune genes than either A. latinuchus or B. torgquatus. That’s consistent with a population bottleneck, since gene sequences accumulate mutations more slowly than microsatellites do; or with recent selection weeding out less-fit versions of the immune genes. Or, possibly, both. Interestingly, Hartmann et al. tracked the survival of brush finches with known immune gene sequences over several years, and found that birds with lower diversity at the immune genes were somewhat more likely to survive. That’s contrary to lots of previous studies on immune receptor diversity, but it might make sense if the birds have just weathered a bout with some disease that remains at low level in the population. These results suggest two conclusions. First, pale-headed brush finches have not yet recovered, at a genetic level, from their near-extinction. The only sure solution for that is more protected habitat for the birds, which would let them build up a larger population — though how easy that will be to achieve is unclear. Second, if Hartmann and her coauthors had only used microsatellite data, which made the pale-headed brush finches look about as diverse as their less-endangered cousins, they might have concluded that the brush finches were in better shape than they actually are. Considering that microsatellites are still often used for assessing the genetic diversity of endangered species, that has worrying implications for many more species than these small insect-eating birds in a tiny corner of Ecuador. This entry was posted in adaptation, conservation, conservation genetics, genetics, natural selection and tagged pale-headed brushfinch.